5"H x 31/2"W x 3"D.
The recommended solution for ex-military vehicles or any vehicles with 24 volt electrical systems. .
Our standard (SD) DC-DC Converter is a 10 amp unit. 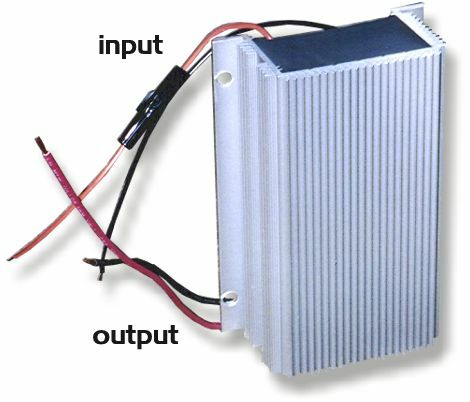 With the 24v-12v voltage reducer, you can run a standard 12 volt radio, CB radio, auxiliary lights or any other 12 volt unit from your 24 volt truck. Is your vehicle ex-military with a 24 volt system? Double battery 24 volt systems are superior in many ways to 12 volt models. Don't even think about converting to 12 volt, and it is not recommended to draw power from one battery only. Q: I have a fording requirement and I need to make sure my 24 to 12 regulator is water proof. A: "You can place this unit in a bucket of water, and it will still work." 8"H x 5"W x 23/4"D.
Xtreme-duty DC-DC Converter provides a 12 volt power source from a 24 volt system with a higher amp draw. Double battery 24 volt systems are superior in many ways to 12 volt models. Don't even think about converting to 12 volt, and it is not recommended to draw power from one battery only. 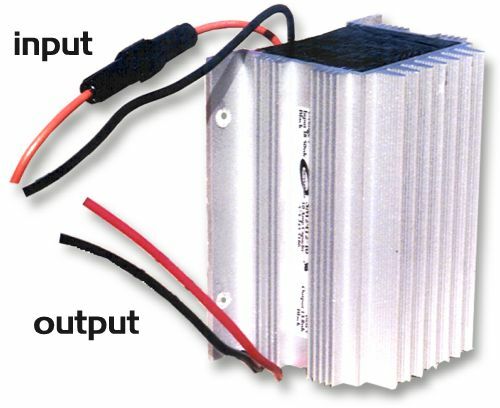 With the 24v-12v voltage reducer, you can run a standard 12 volt radio, CB radio, auxiliary lights or other 12 volt units requiring up to a 25 amp draw. 24 volt electrical systems are found mostly in military vehicles such as Land Rovers, Pinzgauers, HummVees, and Unimogs. The system is made up of two standard 12 volt batteries. This differs from a dual battery system in a 12 volt truck, however. Instead of being connected in parallel, the two batteries are hooked up in series. Parallel: Positives connected, and both negatives go to ground. Series: Ground connected to negative terminal, positive connected to second negative, and second positive connected to all units. Never run 12 volt accessories from one battery, especially a 12 volt unit that draws alot of power (winch, etc.). The danger is that power will be drawn from only one battery and the system will become unbalanced. Do not draw power from only one battery for ANYTHING. Swap around the batteries several times in the season. Always charge both batteries fully. Both batteries must be of the same type. Both high and low efficiency converters are available. Low efficiency converters are cheaper, larger and dissipate extra voltage by heat conversion. Units have large heat fins, and become quite hot. High efficiency converters are superior, run cooler, but are more expensive. . .